A quick photo of the Fontenelle Fire before our helitack crew engaged in suppression efforts. 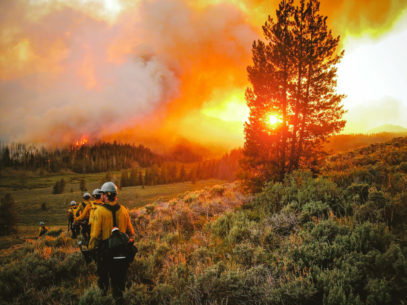 The Fontenelle Fire was first reported on June 24, 2012, burning in Bridger-Teton National Forest, about 18 miles (29 kilometers) west of Big Piney, Wyoming. By July 5, it had burned 57,324 acres (232 square kilometers), though it had not damaged any structures. The fire began south of Mount Darby and spread north on both sides of the mountain’s ridge toward Fish Creek Mountain.